The Frisky Fox is an impressive self propelled lawnmower that combines exceptional value into a good all rounder mower. 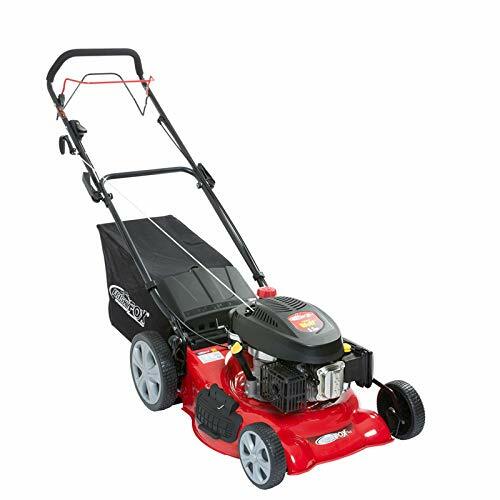 Before we even begin talking about the mower itself, we should point out that it’s can be difficult to buy at times due to being out of stock – you can check the current situation by clicking to check the price and see if it’s in stock at Amazon. As always with our review pages, we’re looking to collate the views of lots of previous customers into a single page for you, to help you get a well rounded view of the products available on the market, and in turn work out the best mower for your needs. In general, you’ll be looking to buy self propelled lawn mowers for a specific reason – perhaps you find it hard work to mow, or have a particularly large garden. On the other hand, perhaps you just like to have the best – and that’s exactly what a good quality self propelled mower like the Frisky Fox can offer. Before we get into the detail of customer opinions, let’s have a quick run down of the feature list on this popular lawnmower. Lets start with the fundamentals – there’s a five and a half horsepower, four stroke engine to drive the mower. If you don’t know a lot about mowers it might not sound a lot, especially if you’ve been more used to hearing this terminology associated with the family car. We can assure you, though, its more than enough to propel the mower across your lawn, and can maintain a strong pull across relatively uneven surfaces. The engine is petrol powered,a fairly tyical feature for mowers, but worth mentioning for completeness sake. The mower cuts a width of twenty inches, which is approximately (actually a shade short of) 51 centimetres. It’s not the widest on the market, but it’s not far short either. If you’ve got an exceptionally large garden, that may be of concern, but it’s likely to be an exceptional case among our readers. It’s an often overlooked feature, but as with most mowers, the cutting height is adjustable. The Frisky Fox Plus 20 has 7 settings, offering a good range of blade lengths from one to three inches – that’s 25 to 75 millimetres. A much more common reason to look up the details on a mower is for what happens to the grass clippings after cutting. One option is to collect them into the 50 litre bag, but there’s alternatives to mulch or dispose to the side or rear of the mower. The dispose (aka discharge) option is effectively spraying the grass clippings back out across the lawn. The idea is that it leaves the cuttings thinly scattered over the lawn rather than clumped together. In this section we’ve collated lots of comments from previous customers, in the hope that any questions or concerns you have about the Frisky Fox can be addressed effectively. While the Frisky Fox doesn’t arrive fully assembled, the job only takes around ten minutes. It’s straightforward and doesn’t need prior experience to complete. Many rival self propelled mowers on Amazon are priced at twice that of the Frisky Fox Plus 20. The majority of comments from previous customers describe a well built, solid mower, suggesting that it’s a reliable product that’s great value for the asking price. A really big plus point is how many people comment on how effective this mower is in longer, wet grass. We’re all guilty of leaving the first mow of the year too long on occasion, so it’s good to know that even though it’s not ideal for the lawn to procrastinate, you’ve got a mower that’s more than capable of dealing with the excessive growth once spring has truly sprung. This is an interesting area which seems to divide opinion – let’s be clear, some people have suggested they’d like the mower to go a bit faster, but the majority are happy with the variable speed range. Perhaps if you’ve got a very large garden and like a brisk walk you might find the top speed a little frustrating, but on the whole people report that they use the speed setting towards the faster end of the scale, but not necessarily the very fastest one. Specifically relating to the assembly, there are a few reports of trouble understanding the pictures supplied. That said, there really isn’t a huge amount to do, as several of those people also concede – looking at the picture of the assembled unit should be enough to clear up any confusion. Customers who have replaced their own models with the Frisky Fox seem to all agree that this is a relatively quiet mower compared to others. It’s probably not a big deal that’s going to affect your buying decision, but if you do happen to have an aversion to noisy mowing, there’s a big plus for you! A much more likely influence to buy this machine is the number of people commenting on how reliably it starts – and often first time. Mowers are notorious for taking a few goes to get firing, so if that’s a frustration you’ve experienced, you’ll see this as a big deal. Especially at the beginning of the mowing season when the mower’s been in a cold dark shed or garage for months, something starting easily is a godsend. Perhaps a slightly picky thing, but it’s worth noting a few previous buyers have got the wrong end of the stick on one point. The Frisky Fox feature list often refers to the fact that you can stripe your lawn – and yes, it can make a lawn look really impressive. What that doesn’t mean though is that it’s going to turn you into a professional groundsman that produces results fit for a Premier League football pitch over night. In other words, if you know what you’re doing, great, but don’t buy this mower on its ‘striping ability’ alone! To summarise, the Frisky Fox really does offer amazing value, especially as it’s a great all round mower that produces a good, even cut mow after mow. We’re not going to pretend it’s the best mower out there – but what it does do is give you a very impressive and solid product without the same price tag as those expensive mowers. selfpropelledpetrollawnmower.com is a participant in the Amazon EU Associates Programme, an affiliate advertising programme designed to provide a means for sites to earn advertising fees by advertising and linking to Amazon.co.uk.